The Navy’s plans for its future frigate (FF) underwent major changes in 2017, as the Navy changed both the acquisition timeline and its approach for selecting a design and builder. After lawmakers expressed serious concerns about selecting one of the two current Littoral Combat Ship variants to upgrade into a frigate, the Navy announced in May that it would slow its frigate transition plans by a year, add an emphasis on anti-air capabilities and consider designs beyond the Freedom-variant and Independence-variant LCS. 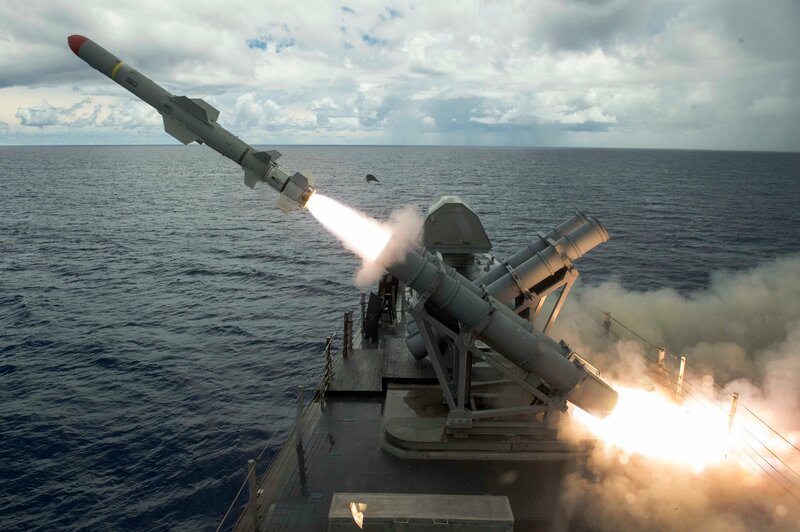 In July the Navy released a detailed account of its new requirements – and announced the designation of guided-missile frigate, or FFG(X), indicating the importance of the added vertical-launch missile tubes into the ship requirements. 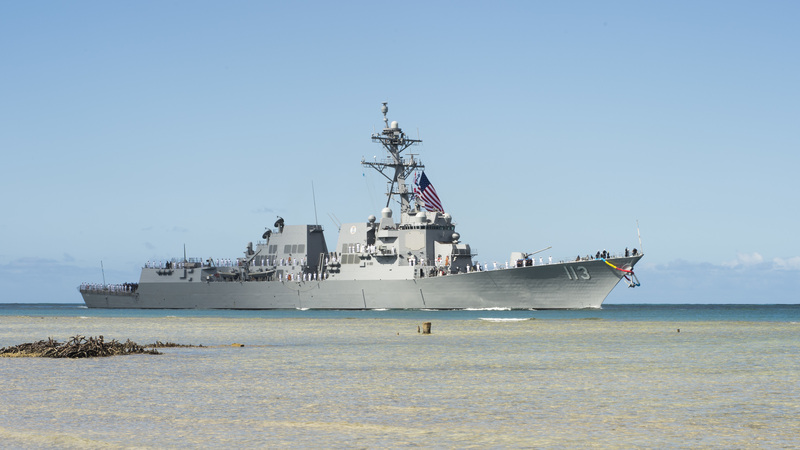 Despite some concerns by naval analysts, lawmakers – including vocal LCS critic Sen. John McCain (R-Ariz.) – said they were encouraged by the new direction the Navy chose to take for its frigate procurement. The LCSs already in the fleet hit some major milestones as well. The Navy stood up LCS Squadron 1 (LCSRON-1) in San Diego, which will retain LCSs 1-4 as test ships and will then group the remaining Independence-variant hulls into divisions of four ships. Each division will focus on either surface warfare, mine countermeasures or anti-submarine warfare, and will include one training ship and three operational ships. Freedom-variant hulls will belong to a similarly organized LCSRON-2 in Mayport, Fla.
LCSs in the fleet, and especially the test division, were hard at work this year, experimenting with new concepts and helping the Program Executive Office for LCS move through its test and evaluation program for several mission package systems. In February, USS Detroit (LCS-7) conducted the first test of the Surface-to-Surface Missile Module, the Lockheed Martin Longbow Hellfire missile. In March, Detroit used its 57mm gun to prove it could sink an incoming surface target and destroy an incoming drone. In August USS Coronado (LCS-4) fired a Harpoon Block 1C missile and used an MQ-8B Fire Scout unmanned aerial vehicle to provide targeting data for a surface target beyond the ship’s visual range. PEO LCS also declared initial operational capability on its Coastal Battlefield Reconnaissance and Analysis (COBRA) airborne mine detection system, bought two more Common Unmanned Surface Vehicles for testing in a minehunting mission, and supported a flurry of testing of programs of record and prototypes alike as it has become increasingly clear that unmanned systems will play a large role in future operations. On the large surface combatant side, the Navy commissioned the first two guided-missile destroyers from its restarted Arleigh Burke-class program and accepted delivery of a third DDG. The Navy signed contracts with both yards to upgrade to a new Flight III design, and the service is marching towards signing another five-year multiyear procurement contract with both yards later this fiscal year. The AN/SPY-6(V) Air and Missile Defense Radar (AMDR), the cornerstone of the Flight III upgrade, successfully tracked a ballistic missile target during testing in July. Significant design maturation and early integration testing efforts have taken place during 2017 to reduce risk on the Flight III upgrade. The Zumwalt-class destroyers (DDG-1000) have had a tougher year. After the lead ship’s late 2016 voyage from the Bath Iron Works construction yard in Maine to its homeport of San Diego was marked by several engineering failures and mishaps, the Navy spent the early part of 2017 seeking an engineering solution to the lube oil cooler failure that twice sidelined the ship. By April the Navy was happy with a solution it had found, after proving out the fix in USS Zumwalt’s sea trials in February. By the end of the year, though, the second-in-class Michael Monsoor (DDG-1001) was having its own set of challenges, this time with the electrical system, that cut its builders trials short. Looking to future operations, the Navy announced the Zumwalt-class destroyers would shift their focus to a surface-strike mission instead of supporting Marines ashore with land-attack weaponry. The service spent significant time and effort wargaming and studying what the Future Surface Combatant family of systems might look like, what missions the ships might perform, how common the hulls and systems may be across the various-sized ships, and other questions to inform the path forward on what will eventually replace the guided-missile cruisers and the Littoral Combat Ships. First-in-class aircraft carrier USS Gerald R. Ford (CVN-78) joined the fleet in June about 15 months behind its original schedule, after working through a string of challenges with power distribution, a new Advanced Arresting Gear system and other leap-ahead technologies included in the new ship design. 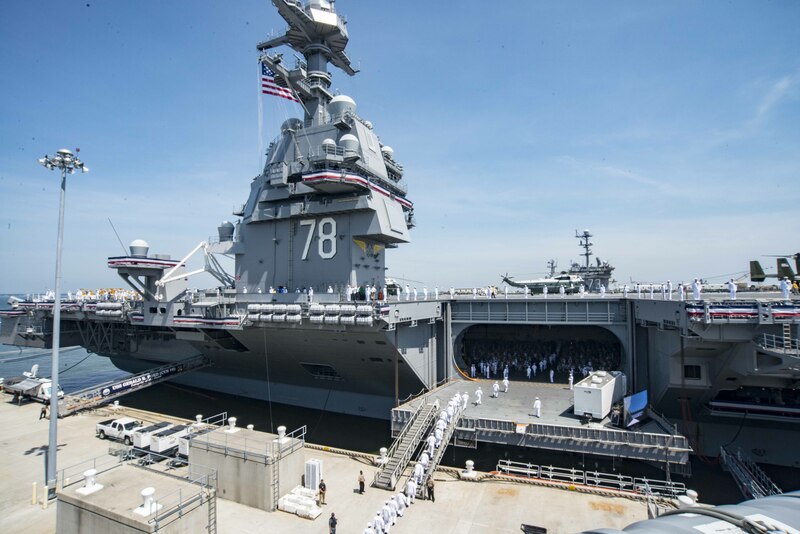 The new carrier completed builders trials in April, delivered to the Navy on May 31 after a successful acceptance trial, and was commissioned in a July 22 ceremony at Naval Station Norfolk. 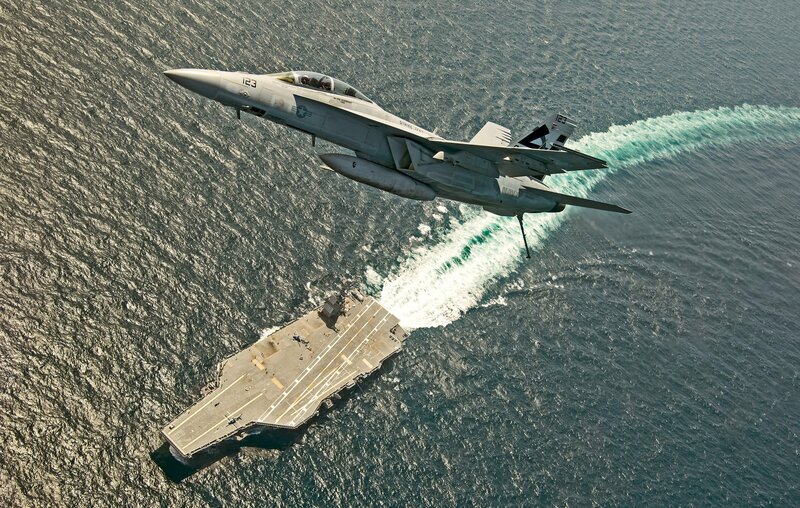 Just six days after commissioning, Ford launched and recovered its first aircraft; up until that point, the new Electromagnetic Aircraft Launch System (EMALS) and the Advanced Arresting Gear (AAG) had only conducted “dead-load” tests on the ship and had only worked with live aircraft in testing ashore. Ground-based testing in the first half of the year worked out a software fix in EMALS to allow the heaviest aircraft in the fleet to launch with less stress to the airframe, addressing a flaw discovered in 2014. Despite challenges with the AAG, the Navy announced in January it would stick with the new system for the second-in-class carrier, John F. Kennedy (CVN-79). Since its commissioning, Ford has spent a significant amount of time at sea for testing and crew training. 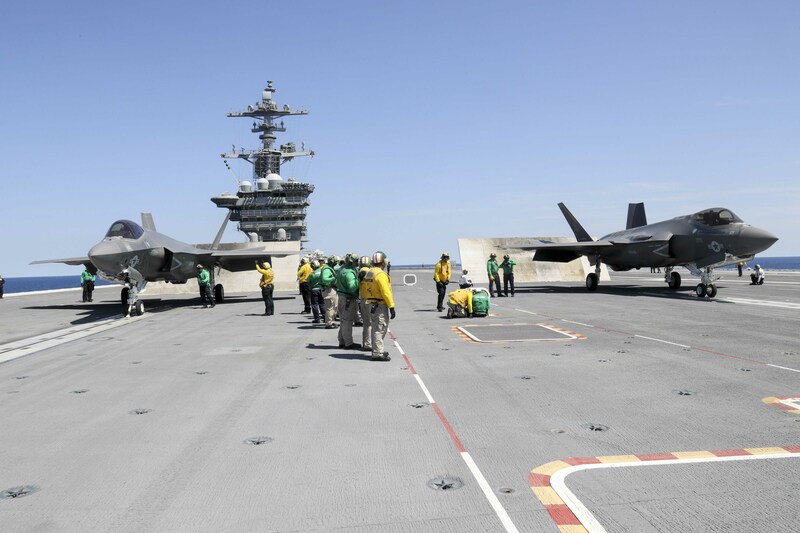 As for the aircraft set to operate off this new class of carriers into the future, the F-35C Joint Strike Fighter and the F/A-18E-F Super Hornet both saw important progress in 2017. The West Coast F-35C Fleet Replacement Squadron (FRS), the “Rough Raiders” of Strike Fighter Squadron (VFA) 125, transitioned out of the legacy Hornet and reactivated as a F-35C squadron on Jan. 12. Pilots from VFA-125, along with their East Coast counterparts, the “Grim Reapers” of VFA-101, operated aboard USS Carl Vinson (CVN-70) and USS Abraham Lincoln (CVN-72) at sea this year. During 2016 F-35C testing aboard USS George Washington (CVN-73), pilots complained that the aircraft bobbed up and down excessively during the catapult launch, making it impossible to read instruments and difficult to reach emergency controls and causing moderate to severe pain for some pilots. In March the Navy wrapped up tests of potential fixes for that problem. As for the Super Hornet half of the future air wing, Boeing began preparations for the first jets to be inducted into a service life extension program early in 2018. To avoid the challenges the company encountered with its 2012 SLEP of the legacy Hornets, Boeing is analyzing in painstaking detail two of the highest flight hour aircraft in the fleet to understand how the planes aged over time. The company began buying material over the summer to support an expected April 2018 start to the SLEP. The Navy also announced in June that it would buy 80 new Super Hornets over the next five years – for a sum of $7.1 billion – to help address a looming fighter shortfall. Even with the SLEP effort on the legacy Hornets and the upcoming SLEP on Super Hornets, the service is using the airplanes at a much higher operational tempo than expected, potentially using up the life of the planes ahead of their planned sundown in the 2040s. The fielding of the MQ-25A Stingray will also help mitigate the strain on the fighter fleet, as some Super Hornets also serve as tankers for the rest of their air wing. The Navy issued a draft request for proposals (RFP) in July for the unmanned carrier-based tanker, followed by the final RFP in October. General Atomics, Lockheed Martin and Boeing have all released images of their bids, while Northrop Grumman surprised many in announcing the company would drop out of the competition. The Navy’s physiological episodes problem came to a head in 2017, with the Navy ordering a operational pause of the T-45C Goshawk trainer in April after a rash of PEs in flight students and instructors. A 30-day review was directed later that month, to look at not only the T-45 but also F/A-18 Hornets and Super Hornets and EA-18G Growlers. While the review came back with many good recommendations – including appointing a lead officer to oversee PE-related efforts – the Navy has been challenged to find a root cause and instead is discovering a web of factors, both pertaining to the aircrafts and the pilots’ own physiology, that set conditions for a PE to occur. The head of naval aviation announced in November that the multi-pronged approach to addressing PEs has yielded positive results: since T-45 operations resumed in full, only five PEs have occurred, and only two of those were not easily explained by pilot dehydration or fatigue or by a clear mistake in operating procedure. Work on the Columbia-class ballistic-missile submarine quietly took place throughout the year, with the Navy not talking much about design and early test efforts on what has been dubbed the service’s top acquisition priority. Despite the lack of fanfare, though, the SSBN program started 2017 by passing its Milestone B decision and moving into detail design on Jan. 4, though the Milestone B review had originally been scheduled for August 2016. After several shipyard visits by Navy and Pentagon acquisition officials, the Defense Department finally signed off on the cost estimates, design, production readiness plan and more. Though continuing resolutions have complicated the program’s transition from research and development funding into shipbuilding funding, lead shipyard General Dynamics Electric Boat was awarded a $5.1-billion detail design contract in September, with Electric Boat awarding partner Newport News Shipbuilding a $468-million contract for its share of design work this week. 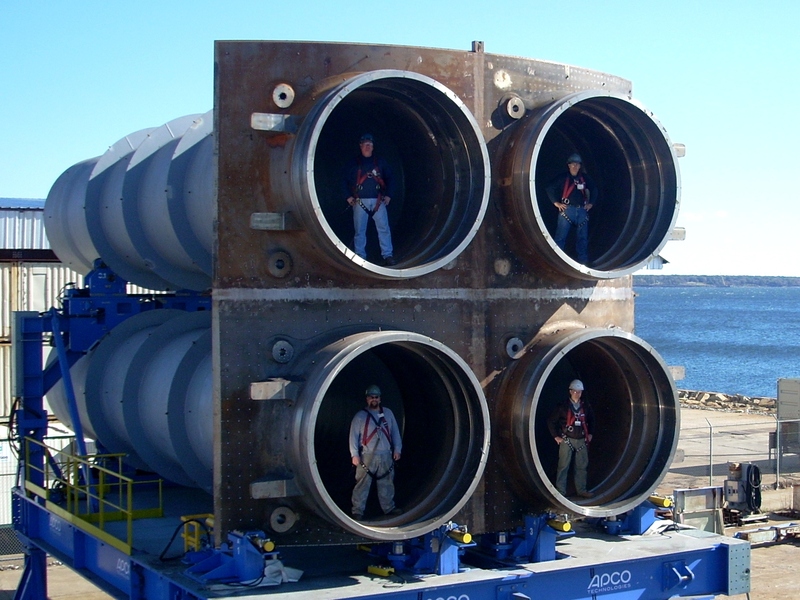 The Program Executive Office for Submarines said in November that the average procurement unit cost is congressionally capped at $8 billion, had been sitting at $7.3 billion at the Milestone B review in January, and was already down to $7.21 billion as detailed planning began thanks to “innovative legislative authority and contracting techniques” the program could leverage. On the attack submarines side, the Navy is still considering what its future Virginia-class block upgrades may look like, as well as what mid-block upgrades the service could insert into the production line. How many submarines a year to buy going forward has been a major topic of discussion in 2017, with no clear answers yet. With a looming attack submarine gap stretching into 2048 if the Navy continues to build two SSNs a year, some want to build as many attack subs a year as industry can handle – without putting Columbia-class construction at risk – though others are more hesitant to go beyond two hulls a year due to industrial base capacity concerns and tight budgets. The aircraft carrier USS Harry S. Truman (CVN 75) departs Norfolk Naval Shipyard (NNSY) on July 21, 2017 — one day early — following a 10-month planned incremental availability. Harry S. Truman will conduct sea trials and return to its homeport at Naval Station Norfolk. US Navy photo. Maintenance at public shipyards continued to be a challenge for the Navy in 2017, though gains were made in working through an extensive backlog. In March, Naval Sea Systems Command said it was 2,000 employees short despite a recent hiring push. But despite not yet reaching its ideal workforce size, pushing about 400,000 man-hours of work from 2016 into 2017, and having a much higher scheduled workload in 2017 compared to recent years, NAVSEA said it would end 2017 with a quarter of the backlog it had in 2016. Part of addressing the backlog was a realization that, if attack submarine work was going to be prioritized behind ballistic-missile subs and aircraft carriers, then more work needed to be sent to private yards to keep the SSNs coming in and out of availabilities on schedule. The service announced in May it would send attack sub USS Boise (SSN-764) to a private yard for repairs, with Newport News ultimately selected to handle that maintenance availability. On the East Coast, a great effort was undertaken this year to keep aircraft carriers moving in and out of the Norfolk Naval Shipyard on time. 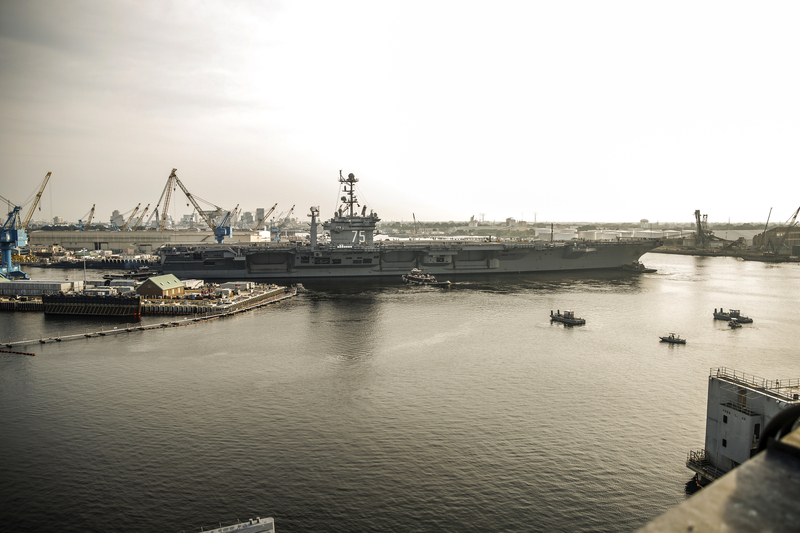 At private shipyard Newport News Shipbuilding, aircraft carrier USS Abraham Lincoln (CVN-72) completed its four-year Refueling and Complex Overhaul (RCOH) in May. USS George Washington (CVN-73) began its RCOH in August after spending the last seven years as a forward-deployed carrier operating out of Japan, where it received more frequent hull maintenance but less nuclear reactor maintenance than a ship based in the continental United States.